It’s not always easy to tell what you’re dealing with when you have a Darth Vader infestation, which makes finding a solution that much harder. 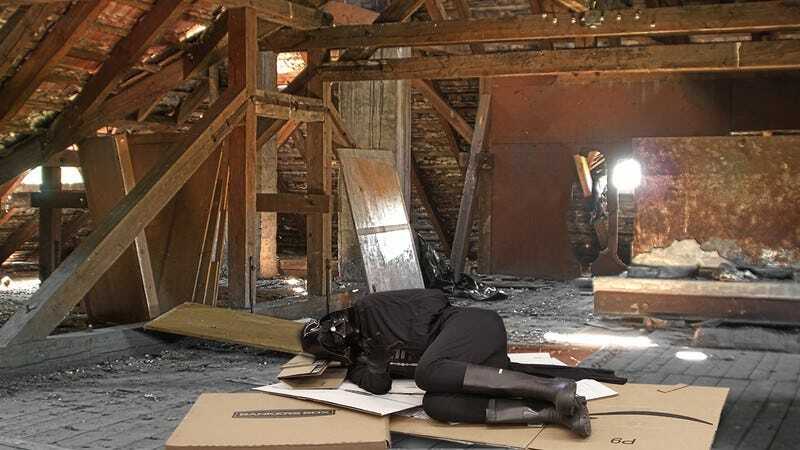 If you have any inkling that the Darth Vader nesting in your attic isn’t the real one, here are six ways to know for sure. 1. He frantically pushes the buttons on his chest protector whenever you enter the attic, even though it’s clear they’re just garage door openers: A more cowardly display than the real Darth Vader would ever put on, this move is a dead giveaway. If, when you approach his nesting area, the Vader in your attic begins frantically mashing his chest protector’s buttons to no apparent effect, it’s likely that somewhere far away there’s a garage door repeatedly going up and down. It’s unclear exactly what he thinks the buttons are supposed to do, but the bottom line is that this move isn’t anywhere in the real Darth Vader’s playbook. 2. You always hear him dragging around heavy objects instead of just picking them up with the Force: The real Darth Vader wouldn’t be caught dead manually moving heavy boxes or furniture, as one of the main perks of possessing the Force is being able to lift objects with your mind. So if you hear the Darth Vader in your attic clumsily dragging around your old metal patio furniture to construct himself a makeshift sleeping fort, grunting with exhaustion as he rips up pink strips of insulation to use as a mattress, chances are you’ve got an impostor on your hands. 3. He wears an insulin pump: Look closely among the garage door openers on his chest protector and there’s a good chance you’ll also see a digital insulin pump flashing his blood-glucose levels, with a tube leading down over his charcoal-gray turtleneck to his belly catheter. In the official Star Wars canon, there is no indication whatsoever that Darth Vader suffers from any kind of metabolic or pancreatic disorder, and so it stands to reason that if your masked squatter is decked out in diabetes supplies, he’s probably not the real deal. 4. He uses a whiffle-ball bat in lieu of a lightsaber: He may try to disguise the fact that it’s a whiffle-ball bat by wrapping it up in neon glow-in-the-dark tape, but it will still be painstakingly clear that it’s not an actual lightsaber. 5. His breathing will be just as audible as the real Darth Vader’s, but in a sad way: Yes, a fake Darth Vader will still breathe incredibly loudly, but it’s likely because he’s either winded from trying to catch a mouse to eat or he’s very, very sick. Whatever the case, the impostor’s intense wheezing will probably be deeply upsetting to everyone in your household, and it’s worth checking in on him from time to time to make sure he doesn’t need medical assistance. 6. He lets his feces accumulate in a pile atop a box of old Christmas decorations: This is a major red flag. Do you honestly think the real Darth Vader wouldn’t have the means to properly dispose of his bodily waste? Of course he would. The real Darth Vader has droids to take care of that stuff. A fraudulent Darth Vader, however, has nothing, which is probably why he’s living in your attic in the first place.